This week... GOP Rep. Elise Stefanik made some primary plans, election fraud allegations upended a North Carolina House race, and news broke that the NRCC was hacked earlier this year. *Eyeballs Emoji* New York GOP Rep. Elise Stefaniktook to Twitter this week to respond to incoming NRCC Chairman Tom Emmer, writing “NEWSFLASH” and that she “wasn’t asking for permission” to play in GOP primaries. So what was that about? Stefanik told Simone that the lack of Republican women in the House has reached a crisis point, so she’s pulling back from her role with the NRCC to “play big in primaries” in support of female candidates. Emmer had some thoughts on that, including calling it a mistake. *Bookmark* The new members of Congress will take office in just a few weeks. Still trying to figure out who’s who? Our data team has you covered with this handy list. Hacked: Politico broke the news Tuesday that the NRCC was hacked this year, with intruders surveilling emails of four senior aides. The committee isn’t saying much about the cyberattack, but a spokesman said that it was orchestrated by an “unknown entity” and that the FBI is investigating. Going on Offense: House Republicans are already gearing up for 2020, when they’ll be trying to win back the majority. On Thursday, the NRCC announced Parker Hamilton Poling as its new executive director. Poling previously served as chief of staff to North Carolina Rep. Patrick T. McHenry, the chief deputy whip. And this week Dan Conston was tapped to lead the Congressional Leadership Fund and American Action Network, the two major GOP outside groups active in House races. Conston, who has previously worked for both groups, spent this last cycle as the head of a new outside group that bolstered two incoming GOP members. It’s the Environment, Stupid? A group of Democratic pollsters unveiled new numbers this week that showed messaging about the environment was a top issue among voters in one key Senate race and two House races, all won by Democrats. And the pollsters say focusing on the environment will be key to more Democratic victories in 2020. About that 2020 Run: There are a handful of House Democrats eyeing a run for the White House, but history is not exactly on their side. Griffin Connolly dives into the dynamics that could spell trouble for House members looking to be president, and how a White House run could help them get a different sort of promotion. That was the overall turnout in the 2018 midterms — the highest nationwide turnout since 1914. But which district had the highest turnout in raw numbers and which had the lowest? Shawn Zeller breaks it down. One key voting bloc has remained virtually unchanged in its political preference: white evangelicals. But while these voters may have had sway at the Senate level this year, it seems their relevance in House races may be waning, Nathan writes in his column this week. Florida GOP Rep.-elect Ross Spano confessed over the weekend that he may have broken campaign finance laws. He borrowed money from two friends and then loaned the money to his campaign without disclosing the original sources. Emily Kopp reports that Spano faces potential fines and even jail time, and that Democrats are saying he shouldn’t be allowed to serve in Congress. So what’s going on in North Carolina’s 9th District? Three days after the election, The Associated Press called the race for Republican Mark Harris, who leads Democrat Dan McCready by 905 votes. Harris, a former pastor who has made some controversial statements about women, defeated GOP Rep. Robert Pittenger in the primary in a district President Donald Trump carried by 12 points in 2016. But now the AP has retracted its call for Harris as the state’s election board investigates allegations of election fraud. A North Carolina woman has admitted to illegally harvesting ballots for a contractor working for the Harris campaign. She was paid to collect absentee ballots from voters with the promise of turning the ballots in (which, by the way, is illegal in North Carolina) and filled in votes for Harris. It turns out a local prosecutor has been investigating irregularities with mail-in absentee ballots for nearly a year. The elections board has delayed certification of the results and is supposed to hold a hearing detailing the irregularities later this month. The board could call for a new election. Or if Harris is declared the winner, a Democrat-controlled House could refuse to seat him and conduct its own investigation. On Thursday, the executive director of the state Republican Party came out in support of a public hearing and said there should be a new election if the board “can show a substantial likelihood” that the alleged fraud changed the outcome of the race. 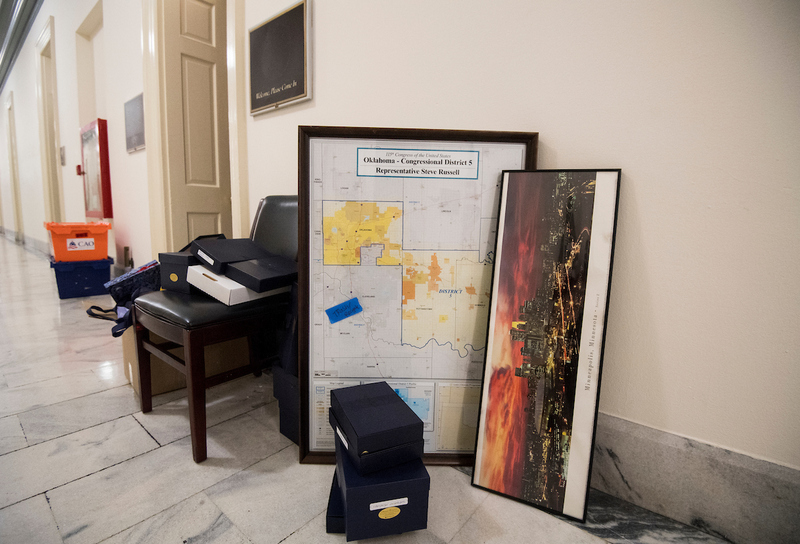 Congress has its quirks, and one of the most entertaining is the new member office lottery. Incoming lawmakers draw numbers to determine in what order they will select their offices, and then scour the open offices to find the best space. Thomas McKinless followed Virginia Democrat Abigail Spanberger as she searched for her new office. And she had a special lucky charm that helped her draw a good number.